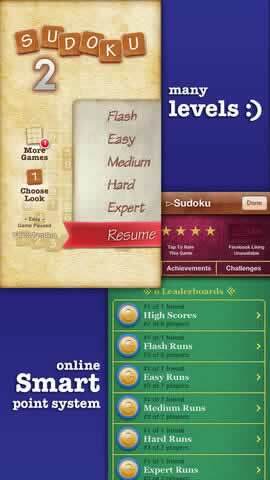 Climb the Online Leaderboards and Show the World Your Mastery of Sudoku! Who does not like Sudoku? Ever since it became a worldwide sensation in 2005, puzzle game fans have been losing countless hours just trying to see how fast they can fill in the blanks in those familiar 9-square boxes. There are Sudoku games in the newspaper, there are entire books filled with Sudoku puzzles, and you can even play it at all sorts of places on the net. However, you can now enjoy the famous puzzler everywhere you go from the convenience of your own smartphone with Finger Arts’ Sudoku! With this exciting edition, you not only have easy access to thousands of puzzles right in the palm of your hand, but there are a bevy of new features and game modes that will surely reinvigorate your interest in Sudoku like never before! The rules of classic Sudoku have not changed. They’re still just as conceptually simple as you remember and the puzzles are every bit as challenging as you can surely recall. Thanks to the game’s electronic format and the touch screen controls, the puzzles are also far more convenient and less tedious to play than the traditional pen-and-paper variants. 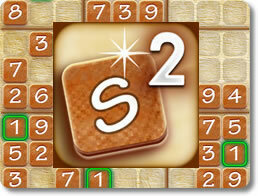 Fill up the squares by swapping the numbered tiles into them with a simple swipe of your finger or stylus. Highlight all instances of a specific number on the grid to get a quick overview of their positions. No more memorization or eye-hunting for you! Play in two distinct styles. Try the Classic look for a more traditional pen-and-paper appearance or Lush to add sharper visuals and more animations to your gameplay. Try your hand at three levels of difficulty: Easy, Medium and Hard. Make use of the note-taking feature to quickly and easily jot down possible number positions without the need to commit immediately. Finger Arts’ edition of Sudoku not only gives you a more convenient way to play the classic game It also adds all new mechanics not found in the original game that alter it enormously in a multitude of ways. Earn point for every game you play. The better your performance and puzzle-solving skills, the higher your score will be. The game scores your overall progress based on the number of sequential games you manage to solve. Use the hint feature to figure out which number goes to which square. Use them wisely; you only have a few hints to expend. Post your score onto the online leaderboards and show the world what you’re made of. 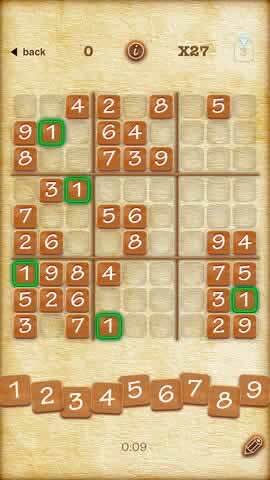 Compare your scores and achievements against your friends to see who the ultimate Sudoku master is. There is nothing else that can be said. This electronic edition of Sudoku is undoubtedly one of the most definitive versions of the game you can possibly experience. It has all the addictive challenge we’ve come to associate with Sudoku, adds in all sorts of new mechanics that make it even more fun to play, and packages it all into a convenient digital format that you can play on the go. Anyone who has a taste for Sudoku must not miss this title.